Here's one good reason why you need to have a pet dog. Charles Sasser of Albuquerque, New Mexico is suffering from Alzheimer's and he has lost almost all of his speech. However, when he is around his family's pet dogs, he comes to life talking animatedly with the pets. Lisa Abeyta, Mr. Sasser's daughter has captured on video one of these miraculous moments when Mr. Sasser regains his power of speech around the family dogs. 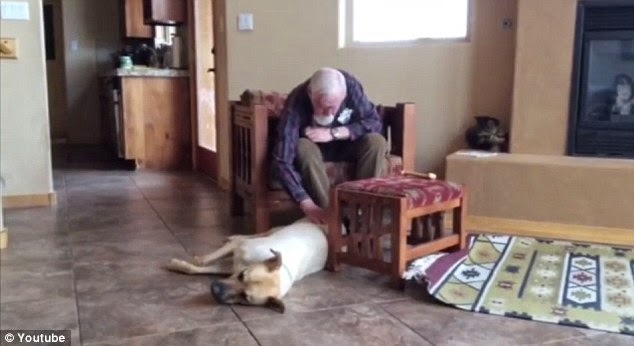 In the video, Mr. Sasser can be seen talking to his dog Roscoe. The one and a half minute clip has touched so many people online. It has generated over two million views on YouTube just a couple of days after Ms. Abeyta uploaded it.